G3 Security is a London based specialist in highly professional, reliable and cost-effective security guarding services for a diverse range of industry sectors including Retail, Corporate, Healthcare, Public Sector & Industrial. Established in 1992, we have gained a wealth of experience within the industry. G3 Security pride ourselves on our full range of excellent Security Management Services and commitment to improving the contents and quality. At G3 Security we set standards high with integrity and professionalism at our utmost importance. Our Guard Patrol Monitoring System is an innovative and easy to use security guard tracking solution for enabling you to show proof of attendance at the site, show evidence of patrolling using NFC tags, send incident reports instantly, take and send pictures of incidents and raise an automatic alarm in the control room for missed patrols. With each passing year, the record of homeless people found sleeping rough on the streets of London is rapidly rising. If you are currently working as a security officer, door supervisory or bouncer you should be trained to handle every kind of difficult situation that may arise whilst on duty. In recent years the security sector has exploded and when searching for a security company the market is wider than ever before. Though there is a lot of competition out there, here at G3 Security Ltd we are confident in the quality of service we provide. A signifier of this is our ACS accreditations and approval. Knife crime in London in recent months has risen to the highest ever recorded levels with 15,0000 offences being committee during last year according to official figures released by the Metropolitan police. Managing a hotel is undeniably a challenging task due to the continuous fluidity of guests coming onto and leaving the premises, essentially, making it difficult to keep tabs on security. Construction sites enact as a tempting target for vandalism, scrap merchants and opportunistic thieves. It is common for a lot of construction sites to suffer some damage at various stages of a project, often repeatedly. In some cases, insurance companies will refuse to insure construction sites without any evidence of the security measures in place. Here at G3 Security Ltd our guards cover a wide range of sites from corporate to construction with both longstanding permanent, as well as temporary contracts. THE FESTIVE SEASON IS HERE! It is time for family gathering and long over-due catch-up’s with our old school friends. G3 Security Ltd are pleased to announce our Employee of the Month for September 2018. 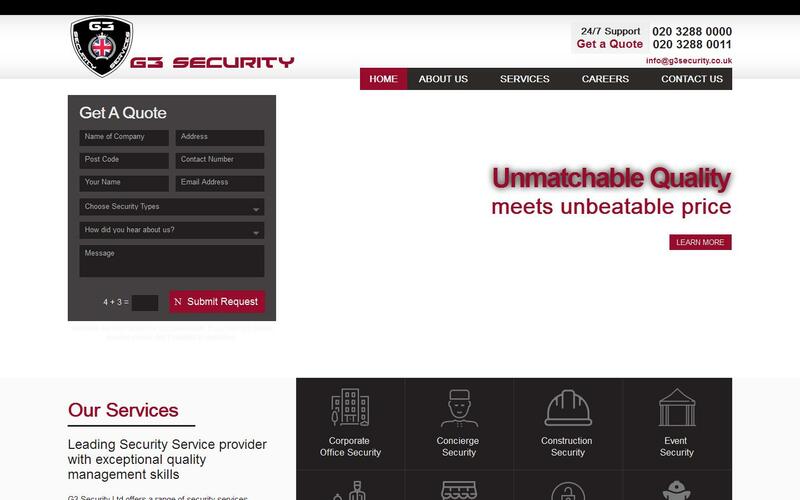 G3 Security Ltd have re-designed their website. 06/09/2018 - It gets earlier every year...! G3 Security Ltd are pleased to announce that we are now taking security bookings for CHRISTMAS 2018! G3 Security Ltd is an independent security company providing man guarding and security guarding services to many clients. 22/11/2017 - Merry Christmas from G3! On behalf of G3 Security Ltd we would like to wish you all a very Merry Christmas and a Happy New Year! G3 Security’s Guard patrol software is an innovative, easy-to-use security guard tracking solution. My name is Manisha and I am the Business Development Manager at G3 Security Services. My comapny hired G3 security Ltd and found it professional with highly trained security staff. I am sharing my amazing experience with G3 Security Services, here. They provided me great service according to my requirements. There was excellent communication between office staff and security guards. Very professional and competative rates.